Nominated for 4 awards, of which it won 3. Nominated for Art Direction (Rochus Gliese). Won Best Actress (Janet Gaynor), Cinematography (Charles Rosher and Kart Struss), and Unique and Artistic Picture (Fox). Please stop what you are doing right now and watch Sunrise. If you have been searching for the perfect silent film, this is it. Starring Janet Gaynor and George O’Brien (who has a star on the Walk of Fame), this tale of love conquering all is a beautiful and extraordinary feat from director F.W. Murnau. An artistic director, he was given free reign in terms of creativity–so much so that at the time, the film did not do very well in the box office and he needed to be tamed in order to direct more films. The story begins with an affair between The Man and The Woman from The City (there are no names in this film). The Wife (Janet Gaynor) knows as soon as he has left the house where he has gone and with whom. The maid says, in the few title cards used in the film, that they used to be such a happy couple they laughed all of the time, but now he ruins his life with That Woman (Margaret Livingston). That Woman convinces O’Brien that he should kill his wife and then the two of them can move to the city to be together. The man is reluctant, weighed down by his choices. The next day, he takes his wife on a boat trip. She is ecstatic and dresses in her best, expecting to go to the city. That is not what the husband is expecting, and he nearly goes through with the city woman’s plans. Gaynor shrinks from him, sensing the intent behind his eyes, but her terror brings him back to his senses and he quickly rows them to shore. Gaynor flees from him. If this movie had been created today, there is no way that Gaynor would have gone back to O’Brien, but in the lovely, romantic movies of the 20s, after many tears, apologies, and flowers, the couple rediscovers the love and happiness they once had for one another. Everything was shot on set, which meant that the budget was huge! This stems from Murnau’s background in expressionism. The critics loved him. The farm and the swamp at the beginning of the movie are incredibly dark and twisted, whereas the city is bright and promising. His incredible use of special effects are mind boggling. 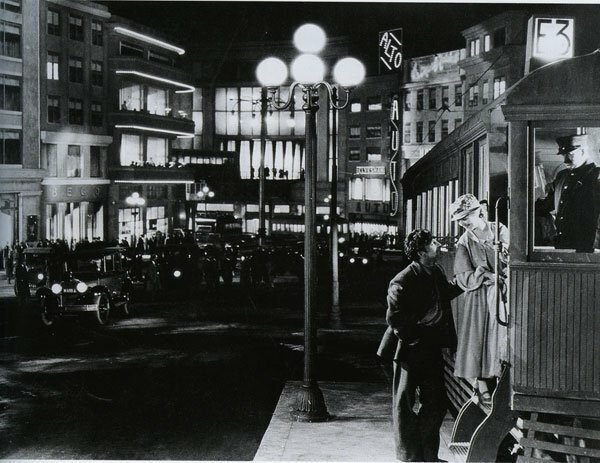 Nothing was done in post, but rather he used several techniques in camera, such as shooting a scene, and then reusing the film and superimposing another scene on top of it. The film falls into so many categories: mystery, suspense, romance, comedy, drama. If you don’t believe that the comedy of silent films can be anything but exaggerated movements or Charlie Chaplin-type stunts, you would be proved wrong by Sunrise. To whet your appetite, imagine a drunk pig. Jeffrey M. Anderson from Combustible Celluloid said that, “if Hitchcock had made Sunrise, the murder itself would have been the climax of the movie.” When I was watching the film, at first I thought the beginning completely out of place, and yet somehow it ties back into the end and what feels like two films is actually only one. This is my one negative about this film, which is why I only gave it four stars. However, everything else was exquisite. It is such a simple plot that was executed so well, I think many filmmakers today could learn from Murnau.